Allied Works Architecture (AWA) today shared designs for the Ohio Veterans Memorial and Museum in Columbus, OH. 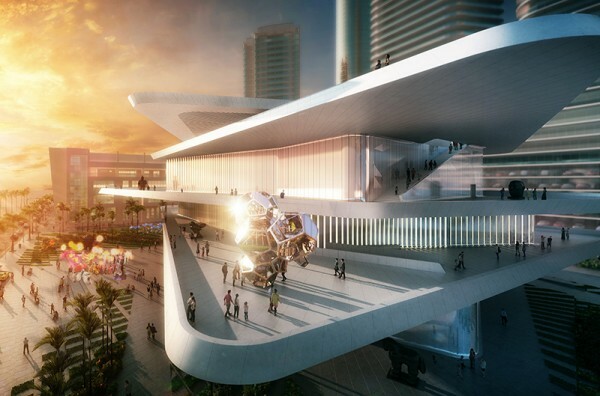 Following an invited competition that included David Chipperfield Architects and Diller Scofidio + Renfro, Allied Works was awarded the commission in the spring of 2013. 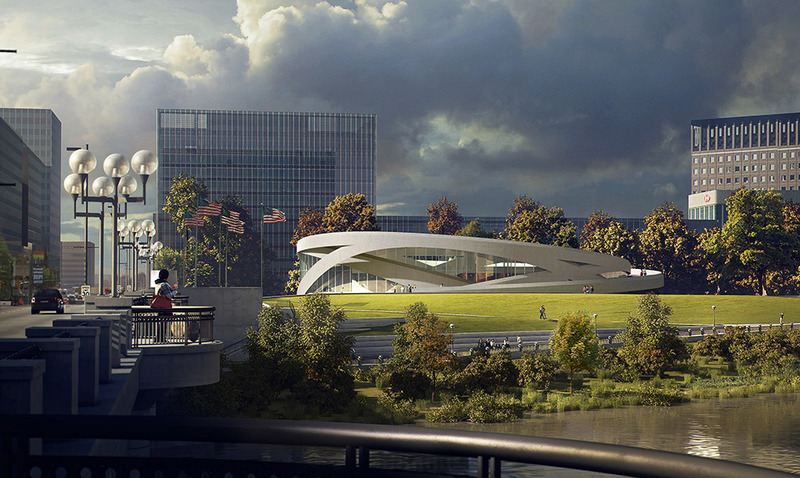 The museum, located on the banks of the Scioto River, directly across from downtown Columbus, will open in 2016. Located at the intersection of the new Scioto riverfront park and Broad Street, the 53,000sf museum houses exhibitions and artifacts that serve as a testimonial to the 250 years of military service of Ohio Veterans. The building provides a variety of education and interpretive spaces. The main level houses a great hall, museum store, and café for public events. Also on the main level is the primary gallery space, culminating in an interactive cyclorama reflecting on the history of service in Ohio. The lower floor contains support, presentation and education spaces, as well as a temporary exhibition space. A private remembrance hall is located on the upper level, adjacent to the exterior sanctuary space, which is approached by a sweeping ramp. 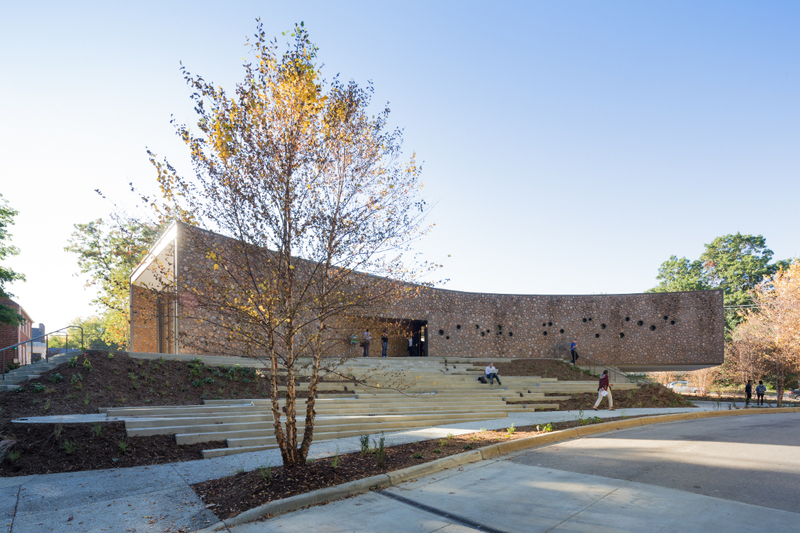 This exterior civic room serves as a ceremonial and memorial space for the community at large. Just like the other European capitals such as Rome, Venice, or Barcelona, Paris risks to become a city museum. The increase of tourists in the French Capital causes panic and also leads to a gradual decentralization from the Parisians. Paris has the largest concentration in m² of museums in the world, nearly 120 museums in total, with many urban areas which tend to be transformed into living conservatories. This makes the city susceptible to become an architectural “outdoor” museum. The continued growth of tourist attractions therefore risks making everyday life less interesting for local residents. In order to meet the needs of short-term housing for tourists, we decided to make further use of the banks of the Seine river, for example the Banks of Saint-Augustin. Inspired by the structure and shape of the booksellers along the river and the cabin hotels in Japan, we propose to use a similar system in the spaces of great cultural attraction, hoping to reduce the decentralization of the citizens of Paris. 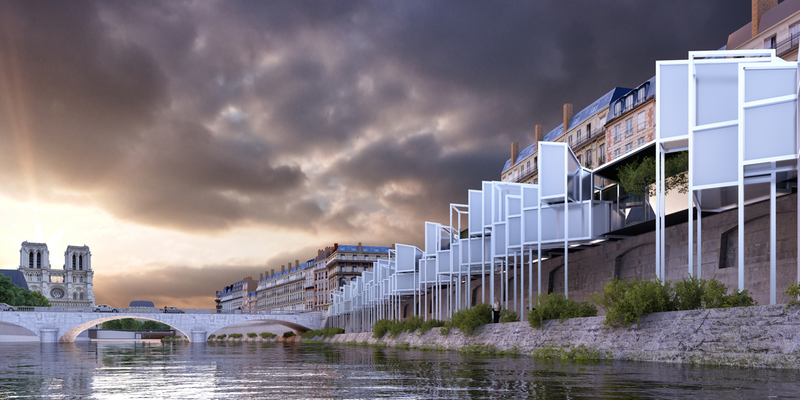 Our proposal is made up of a series of cabins that will be installed on platforms in relation to the Seine and the Cathedral of Notre-Dame. To fully integrate oneself into the site and to have the lowest visual impact in places of such cultural importance, the cabins will be serviced by a secure corridor along the banks that will be accessible only by the users. New York city is experiencing a new golden era, high-rise constructions are booming all over Manhattan, but most of new developments are residential. Beside Hudson Yard, few projects are design for offices even if the city clearly lacks of new renting spaces. Today 80% of offices spaces in Midtown are out dated, old and built decades ago. The ITC tower designed by Chapelle Corentin, 4th-year student at Paris’ Speciale School of Architecture, is an hypothetical project trying to imagine and prove in what ways is possible to design a state of the art office space dealing with nowadays needs in a challenging city such as New York City (what impact such a project can have and could have for the city, what benefits, what opportunities …etc). Focusing on imaging the tower as a trigger for new development and redefine business in midtown. It has been so long for midtown to be only the stage for the most powerful and giant companies but don’t forget that America’s engine is driven by start-ups and small but dynamic companies that one day will could be a major leading one. Performing a new attractive and economic input in Midtown would be a keystone for those particular companies that will design the future of our economy also making on the path the city attractive again for outsiders and welcoming new businesses. Defining new spaces that can be enjoyable even in 1000 feet in the air. Forgetting the traditional floor space, drove by 50’s ideas of consumerism and international style create such hostile and sad space to work in. Expression of comfort and wellness put together with new technologies that improving livable experience but also reducing the tower footprint on the environment are such important factors on a tower that wants to lead a new century revolution in an already aged city. 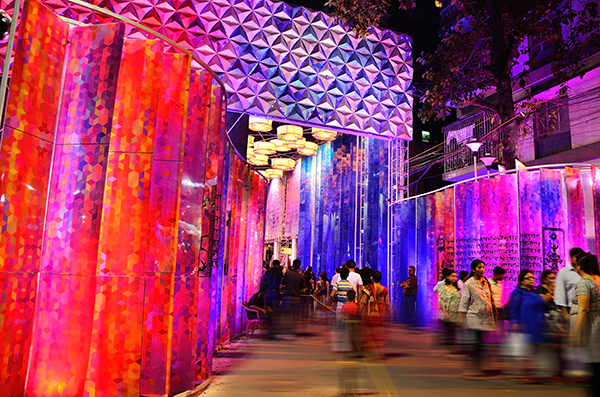 Durga Puja being one of the biggest socio-cultural and religious festival in India, the temporary pavilions or pandals set up to house the idols act as public spaces. The curve walls guide a visitor into the triple height pavilion interior and flow outward, folding and unfolding as one travels. The main idol is placed along the longitudinal axis, framed by the steel pillars. Overall the design of the structure embodies how tradition can be preserved and celebrated within the modern mechanized society. It shows technology is not against tradition rather it fulfills its purpose through future generations, in their original ways. 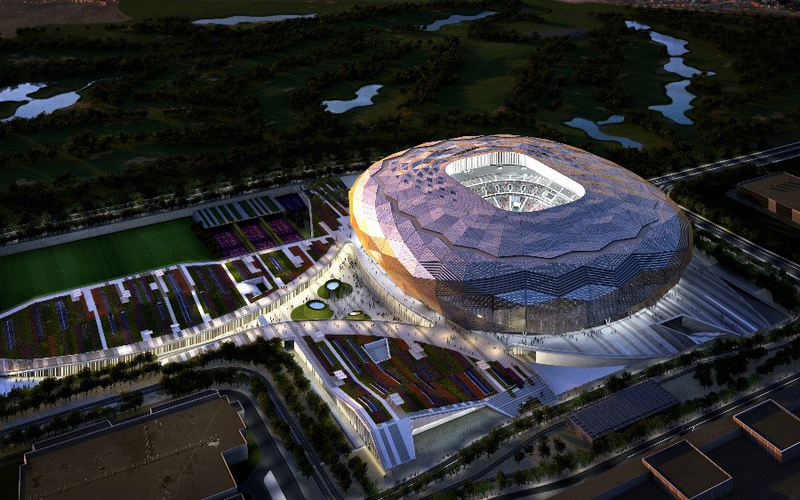 The stadium is part of the Health and Wellness Precinct, within Qatar Foundation Education City and is conceived as a proposed host venue for the 2022 FIFA World Cup™ and one of the principal sports complexes in Qatar. Additionally the Health & Wellness Precinct includes an indoor aquatic centre with two Olympic size pools and a diving pool, a multipurpose sports pavilion housing an indoor athletics track and tennis academy, plus external training fields. The stadium will have a tournament capacity of 40,000 spectators, which is later reduced in legacy mode to 25,000 thanks to a modular design that facilitates dismantling of the upper seating tier. Arup is providing a complete service including structural design, building services, façade engineering, civil engineering and infrastructure, together with consulting services for stadium cooling design, sustainability, fire safety, security and ICT as well as audio visual services. In order to meet the challenges of this project, the team carried out a pioneering R&D program for the stadium cooling system design, which aims to ensure the safety of players and spectator comfort. Historically, convening for social justice has taken place in the most informal settings, with many of this nation’s most important civil rights gatherings, for example, taking place in a church basement, a living room, or even around a kitchen table. The challenge of designing a building from the ground up that fosters discussion and renders this work visible and welcome to all is in many ways unprecedented. The Arcus Center for Social Justice Leadership designed by Studio Gang aims to bring social justice topics up from the basement and squarely into public consciousness. The location became a Housing Expo at around 90 years ago as its quiet ambience remains from the inherited residential surroundings. However, after 11 months of research and analysing the environment, the convenience of people was adopted for their essential needs in everyday life with the flow of time. Having this condition, Timber Dentistry will stand as an iconic architecture that signifies its remaining value, which in the future, endeavours to mend the environmental conflicts. Orientation and shape of the surrounding residential influenced the silhouette of the structure’s west elevation. Gable roof that blends in the neighborhood transforms like drawing an arc towards the west side as its movement shows modernism. 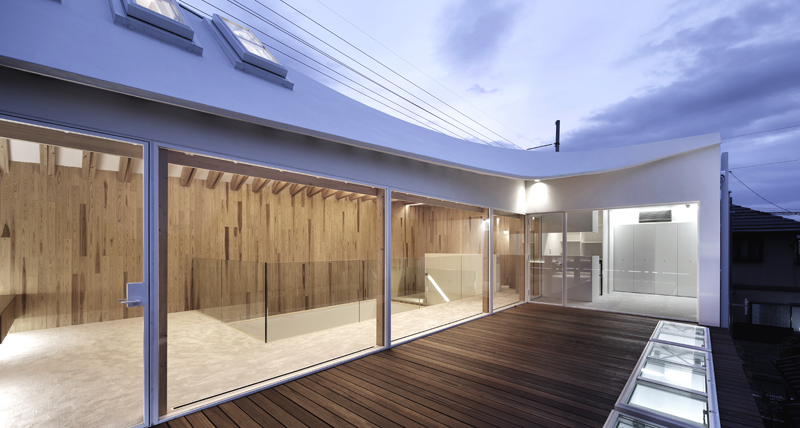 To give a warm impression to the exterior facade, natural materials of wood are used, where walls stand as a white canvas that complements cherry blossoms during its season. The timber structure is enhanced by the transparency of glass, which captivates attention from the eye-level pedestrian located in the first floor. Timber material in inner space blends with the street of cherry blossoms, thus the Architecture itself aimed to blend the inner and outer spaces. “Tree brings sunny and refreshing weather to the circumference.” Intends to develop a reproduction method while preserving its historic context even in a small building.